We love the chairs and table we bought for the van so much that we’ve taken out the bench seat and use the chairs inside instead. Sorry – no more passengers! 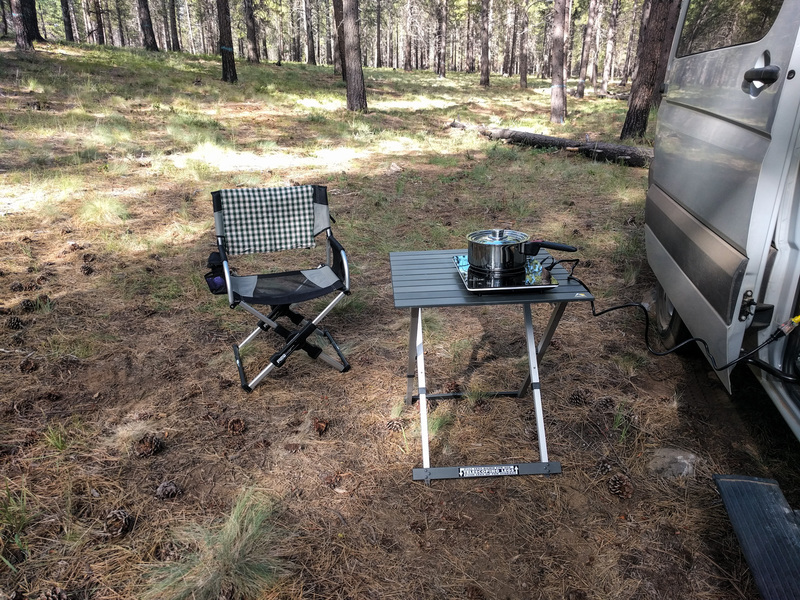 We bought two GCI Pico Arm Chairs and their folding Compact Camp Table 25. The chairs and the table are wonderful examples of well-thought engineering. The chairs fold up to a 20″ x 3.75″ x 12″ size. That’s tiny! They weigh 9lbs each so they are easy to carry. They come with their own shoulder bags. When they are extended, they’re much more comfortable than the regular folding chairs that we used to use. 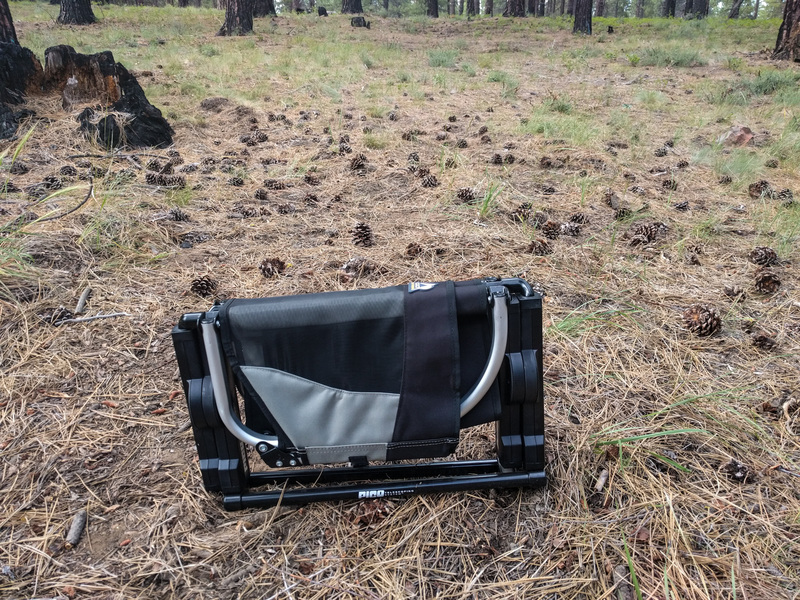 The seat and back offer real support, and they are sturdy. Each chair costs around $75. 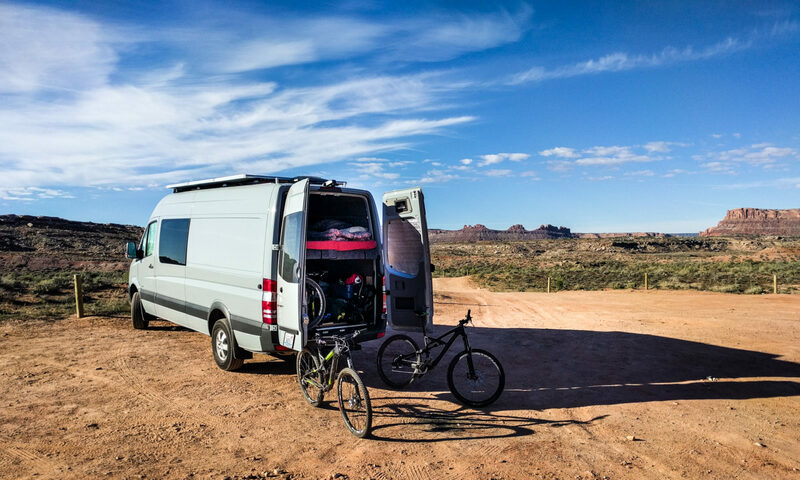 That seems expensive, but they are much higher quality than the big-box store cheapo folding chairs, and they fold up much smaller, which is probably the biggest concern for van use. If you look in the “used” offers for the chair listing on Amazon, often you’ll find basically unused returns being sold by Amazon Warehouse Deals for about $10 less. We bought those and they’ve been fine. The table has extending legs. The legs are held in their extended position by little spring studs. When you close the table up, the support bars for the table top press against the studs, releasing them so that the legs can retract. Genius! The table top is 25″ x 25″ and stands 27″ tall. You can use it without extending the legs, which makes it more of a coffee table height, but it doesn’t have the same level of stability. The table costs around $38. GCI do make a smaller table, the Compact Camp Table 20, which is 18″ x 20″. That one costs around $30. 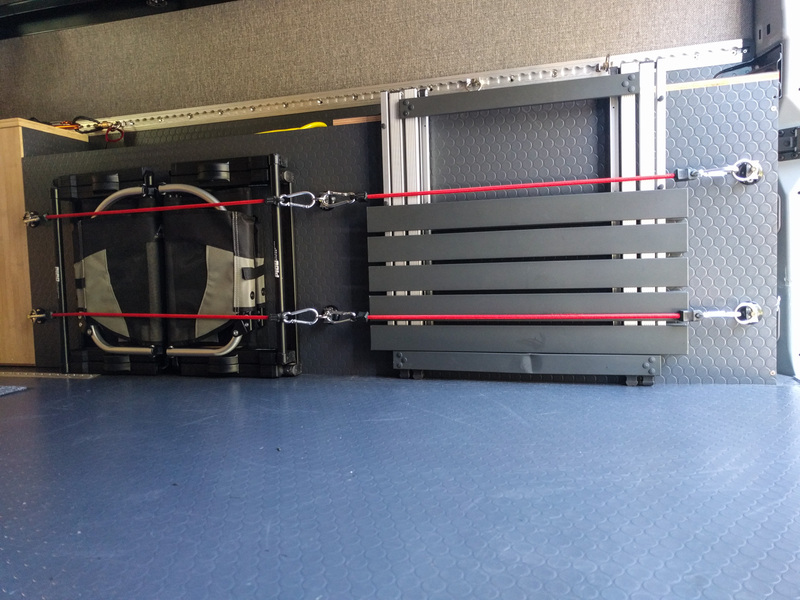 We store the chairs and table against our water tank in the rear of the van. They’re easy to get in and out, and take up hardly any room. We seriously did remove the bench seat from the van. If it’s raining, we can put both Pico chairs and the folding table in the same space as the bench took up. If it’s sunny, the chairs and table go outside. The table is just right for putting the induction burner on outside the sliding door so we don’t get cooking smells and condensation inside the van. It’s also just the right height for eating from when you’re sitting in the chairs. Sure, you could just eat off your lap, but this is much more civilized! Longer term, we’ll be replacing the bench seat with some kind of storage/sitting unit, but for now the extra space is wonderful.